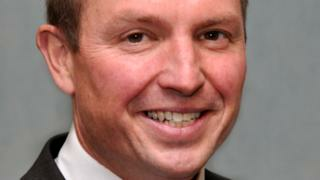 A council chief executive is to get a 20% pay rise because he is "grossly underpaid", councillors have been told. Clive Wright earns about £100,000 a year as Conservative-led Shropshire Council's top official. The council's leader told the 2016-7 budget meeting, at which a 4% council tax increase was agreed, the rise would be performance-related. Although budget plans, including the rise, were made public last week, it was not discussed at the meeting. Lib Dem leader Roger Evans, who voted against the budget plans, said he would have supported a "small rise" but had been given "no justification" for how the council had arrived at the 20% increase. He said "the first he knew" about the rise was from local media. He said there were two paragraphs relating to the pay rise in the council's budget agenda. Councillors approved the 2016-17 budget and agreed to "further develop" proposals for 2017-18 and 2018-19 at Thursday's meeting. The council tax rise means a £46 annual increase for a Band D property. The authority has already made £40m of cuts over the past financial year. Mr Evans said: "I'm surprised members weren't informed about it within the budget proposals at the meeting. "The chief executive works hard and, when compared to other local authorities, he may well not be paid the same. "But given the constraints Shropshire Council is running on and the budget cuts over the next two years... the Tories are talking about shutting swimming pools and leisure centres to balance the budget... I just plead to the public that I did not vote for it." Mr Wright's salary is 55% lower than that of his predecessor, because of changes to the council's pay scale. Council leader Malcolm Pate said the chief executive's salary would still be below average despite the increase and the authoority would not be able to fill the vacancy if he left. He said it was important "to have the right person" running the council and the increase left him "still nearly 20% below the lowest paid county chief executive in the country".